Duration: 32 min. per ep. Photon Earth is a young and gentle boy with superhuman strength and "Baka" (meaning "idiot" in Japanese) scribbled on his forehead (apparently by his troublemaking friend Aun Freya). One day, he finds himself engaged to the beautiful fugitive pilot Keyne Acqua after writing "baka" on her forehead. And that's the least of his worries as he must protect both Aun and Keyne from the evil Papacharino, who seeks to steal the secrets of "Aho" (another word for idiot) energy from Keyne's grandfather's ship. Jeez, where can I begin? Photon is a lot of things. It&#039;s funny, it&#039;s cute, it&#039;s often times extremely perverted, and it&#039;s even pretty creepy here and there. The animes opening scene, for example, involves the beautiful Ms. Acqua running from the evil Papacharino while stripping off all of her cloths in order to ditch a tracking device. Not perverted enough for you? Well things get worse from there. To be honest, if it weren&#039;t for the perversion this might actually make for a great family series, but that&#039;s a whole other subject all together. The series is mostly about the young Photon Earth and his amazing abilities. You can easily compare Photon to somebody like Goku, but let me tell ya, Photon makes Goku look like a Harvard graduate. This combined with the horrible English dub I was stuck watching nearly killed the anime for me. It&#039;s one thing to be all brawn and no brains, but little Photon sounds and looks like he&#039;s suffering from Down Syndrome. This of course causes problems with being able to take Photon seriously when the time comes. Photon is probably the strangest main character I&#039;ve ever seen in an anime. He&#039;s typically not the type of guy you would want as your main character. He&#039;s cute and has some amazing abilities, but he&#039;s borderline mentally retarded. Despite all of his amazing super powers Photon just never stood out as the main character to me. In my opinion that title should go to Keyne Acqua, as she&#039;s the real standout character in the series. But enough debating who gets to bask in the glory of the spotlight, back to the issue at hand; the anime. Since I haven&#039;t made myself very clear on how I feel about this anime thus far, let me just say I liked it a lot more than I thought I would. I read some reviews on it and saw some screenshots before watching it, and it just didn&#039;t really catch my attention, but after watching the first episode I realized it&#039;s actually quite entertaining. Now this doesn&#039;t mean it&#039;s something I would find the time to watch again, but it is certainly something I would recommend to a friend. It&#039;s a fairly simple and straight forward series with not too many surprises or confusing plot twists, but I guess this is a given when a series is only six episodes long. One thing I took notice to is how Photon suffers from the same thing Abenobashi suffers from. At times it tries to be a drama and a comedy all at once, and something about it just didn&#039;t agree with me. See, I&#039;m a pretty picky guy when it comes to genre mixing, and comedy and drama are two genres that can&#039;t be mixed unless there are certain conditions for it. Photon does not meet these conditions. No anime where characters can survive un-survivable situations and come back without a scratch on them like Wiley Coyote can have a serious plot arc taken seriously, at least not in my opinion. I don&#039;t care if it&#039;s the last episode, when an anime aims for something like silly comedy it should just stick to it and not look back. One other thing that bothered me a little bit is Keybe&#039;s engagement to Photon. It&#039;s quite comical how they got engaged (by having &#039;Idiot&#039; on each others foreheads), but it&#039;s a little hard to stomach at times. Now I&#039;m not too sure how old either of the two characters are, but Photon looks no older than eleven or twelve. It&#039;s a little bit creepy to see an older woman acting like the wife of a little boy, but I guess I have seen stranger things in animes. Another drawback in the series is the disappointing anticlimactic ending. It all happens far too quickly and it really manages to take you out of the experience. If you weren&#039;t sure how you felt about the series up until that point I&#039;m sure you&#039;ll be shaking your head in disgust once it ends. I really hate to sound like I didn&#039;t enjoy this anime, because like I said above I did actually enjoy it a lot more than I thought I would, but I can&#039;t help but point out the problems that this anime has. It&#039;s not a bad anime by any means, and with only six episodes it won&#039;t take up much of your time to view it, but you can&#039;t forget the fact that Photon is nearly ten years old. 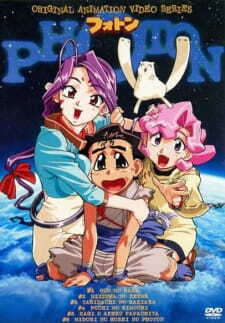 Since Photon&#039;s release there have been hundreds of animes similar to it that arguably do everything Photon does better. When you have that many years of comedy/adventure to choose from I see little reason to go out of your way to watch Photon. Go check out Magical Shopping Arcade: Abenobashi, KO Beast, or even Excel Saga instead. But if you really want to see Photon I won&#039;t stop you. Like I said, it&#039;s not a bad anime and I&#039;d recommend it. I&#039;m just afraid it hasn&#039;t aged very well over the years. I first came across Photon when a close friend of mine wanted me to watch &quot;The Ding Dong Song&quot; Anime Music Video (a must watch). I was curious about what Anime was being used in it and come to find out it was Photon. After a lot of searching I finally found Photon and got to watch it. It is a very interesting and weird Anime. It is a must see Anime. Photon Earth is the main protagonist, he is extremely strong and fights using a quarterstaff made of black crystal. Has the word &quot;baka&quot; scribbled across his forehead by Aun in black ink as he was trying to lead her back home. He's also able to withstand even the strongest blasts of Aho energy, even when it's focused directly on him. Aun Freya is Photon's spoiled, high-strung, flighty childhood friend, she has the ability to create stasis fields. Humorously, she isn't immune to her own stasis fields and can paradoxically trap herself (and everything around her) in a perpetual stasis field. Photon is the only one who is immune to her stasis field and also is the only one who can get her and keep her out of such messes. Keyne Aqua is the rebel space pilot who came to Sandy Planet. Photon inadvertently married her when he wrote the word &quot;baka&quot; in katakana on her forehead in black marker. Sir Papacharino Nanadan (or Papacha) is the bumbling antagonist. Also quite perverted when it comes to women. He has an obsession with Keyne and will stop at nothing to have her, but is always foiled by Photon's intervening. Princess Lashara Moon Known as the &quot;Flower of the Galaxy&quot; due to her beauty, she's the daughter of the Galactic Emperor. She's madly smitten with Papacha, but what she didn't know is Papacha was really going to user her marriage to increase his harem. Pochis Papacha's cute doll-like henchmen. Excluding Pochi #1 (who acts as a leader figure to the others), there are 28 of them, who refer to each other by their number. Though Papacha believes they're all male, in truth, all the Pochis are really female. Then add a couple of other stuff, and you get Photon! A hilariously funny and still epic story set in some kind of fantasy future. Decent. The animation is not the best, but the character designs are great! Nice background details. Great music, some kind of 80's rock anthems which I like. Dope voice acting. What seems like a down-to-earth story, albeit a science fiction one, at the beginning, soon turns out to be a great epic with several unexpected twists. Basically Photon accidently meets a girl out on a quest to find some kind of magical source. She is hunted by the galactic empire, and there you have the basis of it all. Photon himself is an odd character. He is not clever, but very strong and utterly reliable. Not every anime boasts a main character of this retarded kind. The villain, Papacha, is the best character in this OVA. His plans to conquer the universe is constantly hindered by his own vanity and hornyness. This is how all antagonists should be! Plus, his cheerleader blobs add to the fun. The side characters all have their place and help the story go forward. A solid set of fun characters, all in their own way. Anyway, the story is about a little kid named Photon Earth. He has super strength, but is a kind soul, and he has women crawling all over him. Don't worry this isn't one of those guy with tons of girls animes, but it is still a little perverted, the amin villan is a creepy dude if I remember right. But its full of fun futureist like stuff, zany action and reidiculous situations that make you roll your eyes or wet your pants. So I say give it a shot, its only six episodes so it shouldn't take long at all, just remember to not take it so seriousley or you WILL not enjoy it.